AWESOME ANDERSON IS THE AUCKLAND MASTER! World Champion Anderson had won last month's Dubai Darts Masters title and claimed his first win in New Zealand in style as he checked out 50 percent of his darts at a double in both the semi-finals on Sunday evening. The Scot followed up his earlier wins over New Zealand's Bernie Smith and world number five Peter Wright with a stunning 11-7 defeat of Raymond van Barneveld, with his 111.37 average being the second best in World Series history to accompany eight 180s. 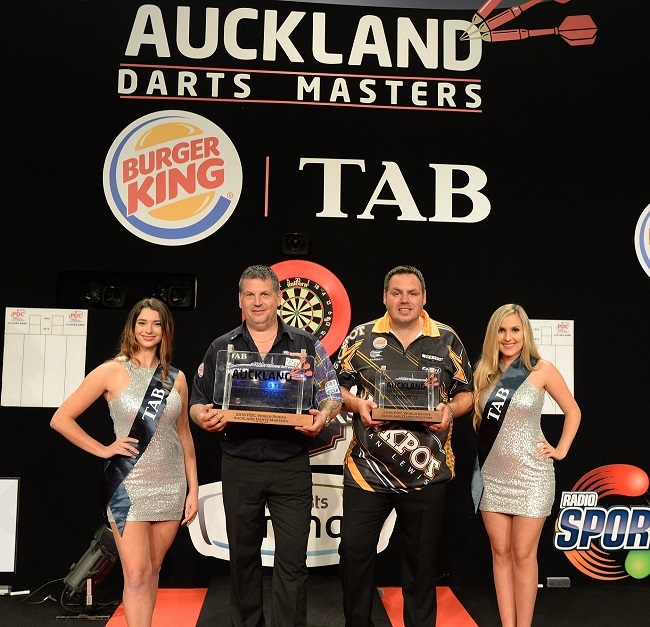 He then produced another scintillating display to thrill the Trusts Arena crowd and take the title in the second Auckland Darts Masters, landing another eight 180s as he punished Lewis' missed doubles to take the title. Lewis held the early advantage as the pair shared the opening six legs, but Anderson stepped in following two misses from his rival in the seventh to finish 68 on double ten to break for the first time. He also took out tops to open up a two-leg lead, with Lewis finishing 121 on the bull to respond only to see Anderson win the next two - despite two 180s from the reigning champion - to lead 7-4. Lewis followed a third-dart double nine with a 150 checkout as he cut the gap to one leg, but Anderson crucially took the 14th leg with a brilliant 11-darter, hitting six perfect darts of two 180s, and then finished 70 in the next to move 9-6 up. Lewis again responded to take the 16th, but a miss at double 12 for a 144 checkout in the next allowed Anderson in to take out 86 on the bull for a 10-7 lead, and his eight 180 of the contest helped to set up double ten as he secured the title. "I'm absolutely delighted and I enjoyed this week," said Anderson. "Everybody played well and there's been some great darts. Barney hit me with everything in the first four legs of the semi-final but I got a leg and when it was 4-3 it was a different game. A few years ago I'd have probably got beaten but now I've got a bit of fight in me. Adrian has played brilliantly too. He was great against Phil Taylor and he's a very good friend of mine, and up on stage we try to have some battles - and the 180s and 140s and doubles came together tonight. Adrian missed a few of the big checkouts but that's darts." Anderson added: "It's been absolutely brilliant and the fans have been fantastic. I loved it in New Zealand last year and again this time." Lewis had won through to his second successive World Series of Darts final with a heavy-scoring 11-9 victory over James Wade, firing in a dozen maximums before coming from 7-6 down to claim five of the final seven legs. "I thought it was a great final and I'm proud of myself," said Lewis. "Gary took out a few great finishes on the bull and so on, and deserved to win it - he showed why he's a back-to-back World Champion. I tried my best but it wasn't quite enough tonight. I missed a few finishes myself and it could have been a different game if they'd gone in. Everybody played well and it was a great tournament, and I think everybody's happy with their performance. Last year I lost in the final in Sydney and then won this one, so I've lost in the final here and hopefully I can take my form to Shanghai." Wade had performed wonderfully in Saturday's quarter-final win over world number one van Gerwen, but was overpowered by Lewis' 12 maximums in their semi-final as he missed out on reaching a second World Series of Darts final. Van Barneveld, meanwhile, missed out on reaching the final in Auckland for a second successive year, despite landing six 180s and achieving a 104.85 average in his tie with Anderson.